I’m not sure what’s going on in our house, but we’ve been in “fixit” mode the last few weeks. Both my cameras, the oven, the dishwasher, the espresso machine, and the foil dispenser all required repairs recently. Now some people might focus on the negative and wonder why so much is going wrong, but I happen to be a “glass half full” kinda guy. I’m just glad I have the resources to get everything back in tip-top shape. Soon all will be back to normal. So what does fixing things have to do with grilled meat? Not much. I know, I digress, so let’s talk about steak. As you know by now, I’m cooking outside as much as possible this time of year. Stuffed flank steak finally topped my to-do list and for today’s post—a grilled and stuffed version with spinach, sun-dried tomatoes, and mozzarella cheese. The biggest challenge to this recipe is butterflying the steak. This step requires a very sharp knife and a little patience. You start by placing the steak on a cutting board with the grain perpendicular to your body. With a very sharp knife, begin cutting into the steak along the side, with the blade parallel to the board. As you cut, pull up on the top portion of the steak so you can see where you’re cutting. You’ll want to make sure that you’re cutting as close to the middle of the steak as possible so the two sides will be the same thickness. Here’s a link from the PBS series, Martha Stewart Cooking School, where she butterflies a steak. In this video, she demonstrates techniques for butterflying chicken, steak, shrimp, and turkey. If you’ve never butterflied a steak, you’ll find this video very helpful. Once the butterflying step is done, you simply spread the cheese, spinach, and tomatoes over the steak and tightly roll the steak with the grain of the meat going the length of the roll. Securely tie the roll with kitchen twine and you’re ready to fire up the grill. Place the steak on the grates and brown for about 2 minutes on each side. Turn off one of the burners on your grill and lower the other burners until the temperature is reduced to 400 degrees. Continue cooking over indirect heat for 30 to 35 minutes or until the internal temperature reaches 135 to 140 degrees for medium rare or 140 to 145 degrees for medium. You’ll definitely want to use a meat thermometer to insure you don’t overcook or undercook the steak. Serve this steak with some grilled asparagus and a summer salad and you’ve got a sensational low carb dinner. 2. Place butterflied steak on a cutting board. Season steak with 1/2 teaspoon salt and 1/2 teaspoon pepper. Spread cheese over steak. Top with spinach and sun-dried tomatoes, leaving a 2 inch border on top side of steak. Begin rolling steak tightly with the grain going the length of the roll, starting with the side closest to you. Tie roll with kitchen twine at 1 inch intervals. 3. Brush outside of roll with olive oil and season with 1/2 teaspoon salt and 1/2 teaspoon pepper. 4. Place steak on grill, browning on each side for two minutes. Turn off one burner and lower the others so the temperature stabilizes at 400 degrees. Cook over indirect heat for about 30 minutes or until internal temperature of steak reaches 135 to 140 degrees for medium rare or 140 to 145 for medium. 5. Remove steak from the grill, cover with aluminum foil, and rest for 10 minutes. Slide and serve immediately. How do you think this would be if cooked on a rotisserie? I think that’s a brilliant idea. I’m sure it would work beautifully. Just be sure and monitor the temp so it doesn’t overcook. Nice work! Thank you SBD for sharing. Curious, what other cuts of beef work well for this dish? Thanks for dropping by! You could probably use a beef tenderloin for this recipe, but that might be a little pricey! This sounds awesome. I made a similar dish called Matambre (hunger killer) which is popular in SA. Matambre is a pinwheel of green/red/yellow peppers, carrots, sausage, cheese, hard boiled eggs, basil, and oregano. I cooked it in tinfoil so the cheese did not all melt out. I think basically anything wrapped in beef would be delicious. Thanks, Mike. I appreciate you stopping by SBD. Your version sounds fantastic. I might have to try your version! Can u just cook this in the oven? Also at what temperature? Thanks for dropping by SBD, Sandra! You could certainly make this steak dish in the oven. I would suggest 400 degrees. Just guessing, I would say 20 to 30 minutes, but I highly recommend using a meat thermometer to assure getting it to your desired temperature. Hi! I made this for company dinner last night and it was really good. It’s a bit cold to BBQ so I seared it in a large fry pan in butter and oil and roasted it in the oven. That gave me lots of nice brown bits to scrape up and use for a gravy. I served it with parmesan crusted potatoes and asparagus. YUM! Thanks for a great recipe. Thanks so much for the feedback, Judy. I’m glad you liked the recipe. I appreciate you visiting SBD and I hope you’ll keep coming back! Happy holidays! May I start this on the grill with the browning and transfer to the oven to continue baking? Thanks for dropping by SBD, Jeanne. To answer your questions, yes, that would work just fine. I highly suggest using a meat thermometer to make sure you get it to the right temperature. Let me know how this recipe works for you. Schweeeeet! Can’t wait to try it. How about some marinade for this as well? What would you suggest? And how about some crab stuffing with this as well? That looks amazing. I really should get a grill. 🙂 I’ve been wanting to try something similar in the oven for a while now. I’ve just never butterflied something large like that so I should just do it and get over my apprehension. I use my meat thermometer a lot as well… one of the best (inexpensive) investments I ever made. On a side note, I heart Martha’s Cooking School…she cracks me up. This is perfectly done! I love to butterfly steaks like this. Haven’t done a stuffed steak in years and years, though — you’ve reminded me how good these can be. Fun recipe — thanks. Oh Bill! I love you! This recipe is amazing. Flank steak is so versatile, and I love how you used it here. Oh yum. I just love flank steak and I do recall stuffing it once…a long time ago. Seems the time is right to do it again Bill; this really looks terrific. We don’t eat a lot of beef because neither of us can cook it! We kill it every time…but this, this looks like something I can do! Thanks for sharing! This steak looks amazing! Love the stuffing, the mozzarella and sun-dried tomatoes sound delicious! Hope everything has returned to normal- All things broken are now fixed. 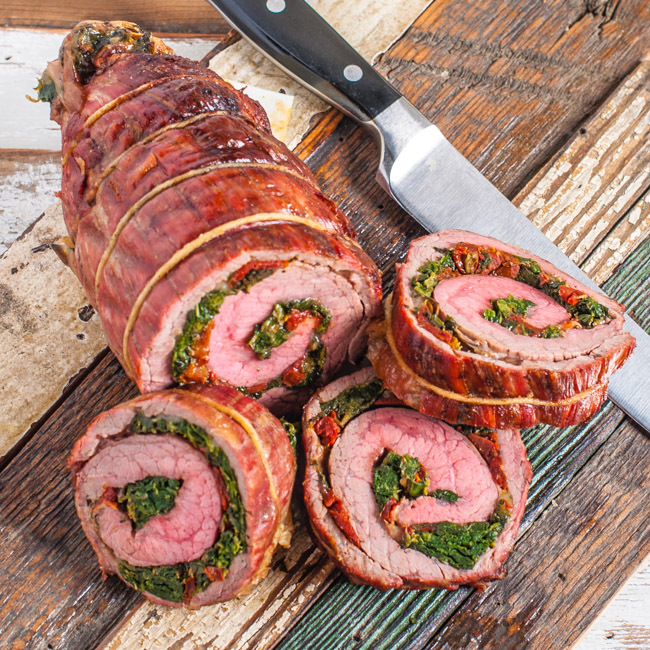 The stuffed flank steak looks divine. If I bring a good bottle of wine can I pull up a chair and join you? Loving this flank steak Bill! It’s such a delicious cut of meat! I’ve never tried butterflying it before… gotta try it out! And I love that gorgoeous wooden backdrop you have in the first photo. Is that something you made or bought? I found a guy in Atlanta that makes tables from distressed wood. He’s made several table tops for me. Thanks, Greg! I use the lump charcoal as well along with the paraffin wax charcoal starters. If I want a medium fire, I just use one. If I’m wanting a really hot fire, I use two or three. Try those starters and you can have more control over how hot the fire gets. I have wondered how to do this with a flank and get the gran going the correct way so it cuts correctly. Now I finally understand. I am a huge meat thermometer person. Without it I always overcook grilled meat. I agree, Katie. I’ve been cooking for years and I still rely on a thermometer. Your steak slices look like pictures on a plate with their red, white and green swirls. Beautiful and very impressive entree. We have weeks when more than the share of things break or go wrong. Now that it’s behind you, I hope you have a leisurely weekend Bill. Thank you so much, Sam! Have a great weekend!